Hope's Cafe: Certain Dri Summer Sweepstakes Giveaway!! Do you remember my review of Certain Dri? Well, I have to tell you...Certain Dri quickly became my #1 favorite deodorant! 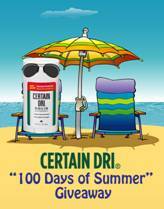 And, starting this Friday, Certain Dri is giving away 1 Anti-Perspirant a day on their official Facebook page! For 100 days, one random entrant will be chosen to receive a Certain Dri Anti-Perspirant (roll-on or solid). Check out the official rules and details on the Certain Dri Facebook page!